Can I download or save iPhone voice mail messages? Just got the best voicemail message ever from my Mom and I want to save it forever. How can I copy or download it from my Apple iPhone onto my Mac? In general, Apple seems to feel that voicemail messages live in a special little box on your iPhone where they can’t be touched, shared, saved, copied, or much else other than listened to or deleted. Even when you have your smartphone hooked up to your MacBook, iMac or other system and it’s busy sync’ing with iTunes, those voicemail messages are still in that protected box, inaccessible. But not to third party apps! Turns out that underneath the shiny interface of iOS, your iPhone has an entire file system and everything saved on it, from text messages to music files, photos to, yes, voice mail, are just files waiting to be accessed. Now there are instructions online for how to do so from the command line, but really, why go through all the hassle when there are some very slick applications you can download that let you traipse through the filesystem with a pretty user interface? Of those options, my favorite is IExplorer from Macroplant.com. See that “Voicemail” button? Easy, isn’t it. Since I want to save the three most recent voicemail messages on my own iPhone 5s, I’m going to select the first, as you can see above, then shift-click to select #2 and #3. They can be exported, en masse, by clicking “Export Selected…” on the bottom. Notice that the messages are saved as file type AMR (Adaptive Multi-Rate Codec), but that’s no problem. On the Mac side, QuickTime Player, the Finder and VLC all play them just fine. On the Windows side, these files work with File Viewer Lite, QuickTime Player for Windows and VLC. You can also use a free program like Audacity to convert audio file formats if you want, it’s easy: Open the file in Audacity, then “Save As…” and specify MP3. That’s it. Now why Apple makes it so darn hard to get to our voicemail messages? I can’t really say. Thanks very much, Dave. I’m going to look for a free third-party tool. I’m so excited to find this tutorial. My sister passed 6 months ago and my old iPhone has the very last messages she sent. I can’t get rid of it and was looking for a way to “save her voice.” Thank you, sincerely. I just want to know if I upgrade to a new phone would I still able to access the voicemail messages that are on my old phone? 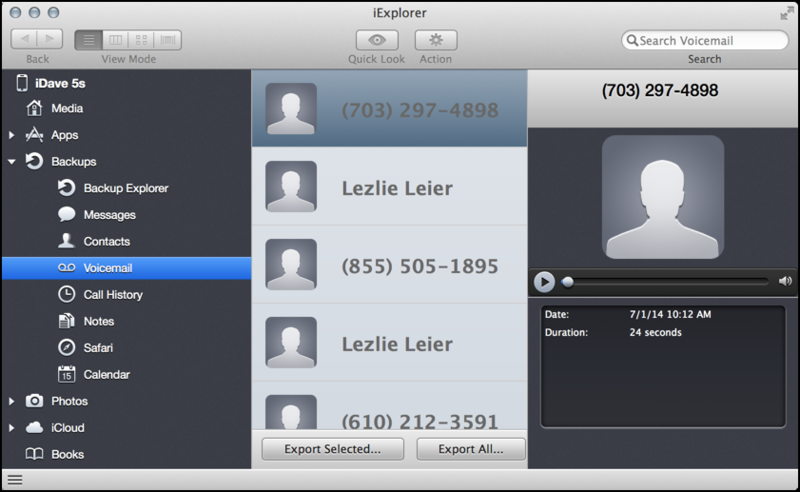 I tried to use the iExplorer but after following the instructions the voicemail, contacts is still blank. My photos were there but not anything to do with the voicemail. upgrading to a new phone shouldn’t matter as the program isn’t tied to an active SIM card or anything. Hmmmm… are you sure that the voicemail messages are on the old phone still? Tried a different cable? Is there a way to save voice mail messages for free? This one costs $30. I traded up my AT&T iPhone 4 with the iPhone 6 (OS 8.0.2) last fall and had them sync the phones information from the old to the new. But when I thought about it a couple of weeks later, I noticed that ALL of the voicemails that I had (probably listened to) were gone. My sister passed away unexpectedly and tragically prior to the trade and it did not occur to me at the time that her messages might be lost. Have I have lost her voice forever…? Is there a way to retrieve the old voicemail – maybe from iTunes? Any thoughts would be very much appreciated. I have been using PhoneView for a year now – it is a great way to save everything from my iphone – call log, voicemail, contacts, music,etc. Easy to use and has helped me when I have “lost” non Apple ringtones when updating with iTunes! Just wanted to let you know that I was not able to use IExplore without paying minimum $35, and given previous comments on functionality, I chose not to pay up. If you know anyway to do this for FREE, given I don’t need to save tons of messages, your advice would be most welcome. Thank you for this! I have very sweet messages from my dad who passed away almost 2 years ago. I’ve been avoiding setting up my new iPhone because I didn’t want to lose those voicemails. 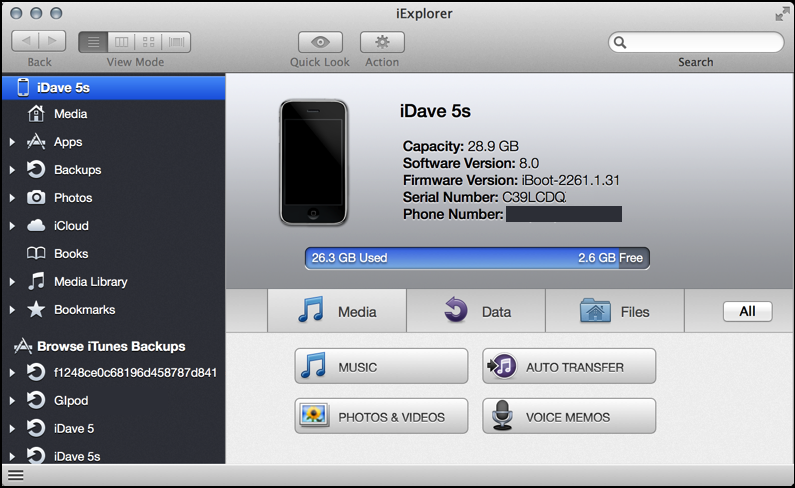 Dave, I bought IExplorer for over $30 and IT WILL NOT DOWNLOAD ANYTHING FROM MY IPHONE, INCLUDING MY VOICE MESSAGES. I WANTED TO TRANSFER A FEW VOICE MESSAGES TO MY COMPUTER BEFORE USING MY IPHONE 6 AND IEXPLORER DOES NOTHING WHEN I CLICK ON VOICE MESSAGES. $30 LATER. Contact their customer support, request a refund. If that doesn’t work, drop me a note via the ASK form and I’ll try to help you out. Does this app work if you switched carriers and already ported your number to a new carrier? I was told by Apple that the iPhone doesn’t hold the messages and that the old carrier “loses” the messages from their server once you’ve ported. Great write up! If your receive any questions about saving voicemails from other phones, our product does just that! (iphone on the way). I would like to download my voicemail messaged from my iPhone 5 and then I will be switching to galaxy 4note tomorrow. After tomorrow no more iPhone 5. Will this program also work with my new phone..the galaxy 4 note? 2 years ago verizon helped me get same message (my father’s voice message) from my old cell phone to my new cell phone but verizon tech support told me today they can not help me. I’m fine with purchasing program if program will would with Galaxy note 4.